Derbyshire’s tailenders clung on for an unlikely draw to earn 11 points at Glamorgan in the Second Division of the County Championship. They ended on 147-8, in pursuit of 325 in 63 overs, thanks to Tony Palladino, who faced 108 balls for his unbeaten 30, and Duanne Olivier as the pair successfully defended for the final 14.3 overs. When Derbyshire lost their eighth wicket, Glamorgan were favourites to win but, with stubborn resistance and good fortune, Derbyshire held out. On the final day Glamorgan’s Kiran Carlson and Usman Khawaja shared a record partnership of 289 for the fourth wicket — the highest for any wicket for Glamorgan against Derbyshire, surpassing the previous record set by Mark Cosgrove and Michael Powell. Glamorgan had resumed at their overnight score of 201 for 3, making rapid progress in the opening session as 107 runs were scored in the first hour at the rate of six runs an over. Kiran Carlson and Usman Khawaja shared a record partnership of 289 for the fourth wicket, the highest for any wicket for Glamorgan against Derbyshire, surpassing the previous record set by Mark Cosgrove and Michael Powell. Both batsmen surrendered their wickets in the quest for quick runs, and after David Lloyd had struck a brisk undefeated 43, Glamorgan declared to leave Derbyshire to reach their target of 325 from a minimum of 63 overs. Alex Hughes was the next to go when he edged Hogan, who had changed ends, to second slip. The visitors were soon in trouble as Harvey Hosein had his middle stump uprooted in Michael Hogan’s first over, then Ben Slater was LBW to Andrew Salter - also in his first over - with Derbyshire struggling at 18 for 2. 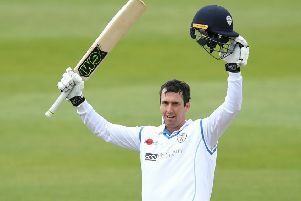 Much depended on Derbyshire’s best batsmen Wayne Madsen, and he responded with some aggressive shots, notably against Salter, whom he struck for three fours in one over. Derbyshire resumed after tea on 77 for3, with 40 overs remining, but there then followed a flurry of wickets. Ben Godleman was the first to go when he chipped Prem Sisodiya to mid-wicket, before the 19-year-old debutant took the vital wicket of Madsen, who was caught at backward point. When Matt Critchley became Hogan’s third victim, Derbyshire had slumped to 93 for 6, but Wilson and Palladino provided stubborn resistance for 15.2 overs. Wilson faced 72 balls before he was LBW to Lukas Carey for 26, a decision he clearly didn’t agree with, as he stalked back to the pavilion. Hamidullah Qadri quickly followed for a pair in the game to give Hogan his fourth wicket - but there was further frustration for Glamorgan as Olivier joined Palladino to defend on a pitch that offered little to the bowlers.